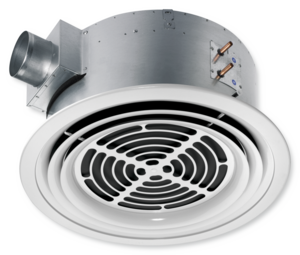 Chilled Ceiling Elements, type WK-D-UM are designed for the control of internal heat loads, where the energy benefits of cooling by means of water are required. A high cooling capacity per unit area provides a low cost solution to the local indoor environment. The WK-D-UM chilled ceiling element consists of a copper tube meander which is flattened and press-clipped into a perforated support plate. The flattened copper tube provides improved contact with the rear of the metal ceiling tile. This installation method ensures good radiant exchange between the ceiling tile and the support plate which improves thermal performance without influencing the acoustic characteristics of the suspended ceiling. Specially shaped fixing straps (2 per ceiling tile) hold the element in place in the ceiling tile. The WK-D-UM chilled ceiling element is also suitable for use with plasterboard ceilings. With the TROX multifunctional beams type MFD room air is inducted via the heat exchanger (2- or 4-duct system), which is mounted above the nozzle pipe. The induction air is heated or chilled when passing through the heat exchanger. Mixed with the supply air it is discharged to the room as a free stream following the profiled wings. The suspended lighting sail is longer than the diffuser unit and therefore ensures even illumination of the room. Depending on the type of lighting fixture direct or indirect lighting rates can be guaranteed. All fronts are masked with shapely cover plates following the curves. 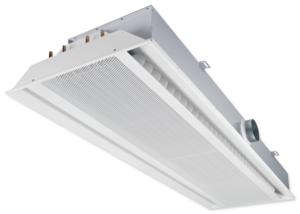 The convective chilled ceiling elements type WK-D-EL in the elliptical shape can be used for open transfer or in connection with the open grid ceilings as visually sophisticated convective chilled ceiling. The convection is approximately 70 % and 30 % radiation portion. Due to the high convection very high internal heat loads can be dissipated, where the energy benefits come through the medium of water here are particularly felt. With additional open grid ceilings of the effective free area should be as large as possible, to maintain the high efficiency of convective chilled ceiling. The convective chilled ceiling elements type WK-D-EL consist of thermal conduction,made from extruded aluminum profiles, provided with pressed-in copper pipe. The hollow, curved shape of the lamella is an attractive cover design and brings very high cooling capacities. Special designs such as tilting modules, combinations with air diffusers, etc. are possible. Active chilled beam for heating and cooling, with 2-pipe or 4-pipe heat exchanger, for integration with various ceiling systems. 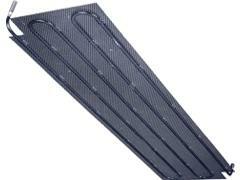 The condensate drip tray is useful if the temperature temporarily falls below the dew point. Chilled ceiling elements type WK-D-UL are designed for the dissipation of internal heat loads, where the energy benefits of cooling by means of water are required. A high cooling capacity per unit area provides a low cost solution to the indoor environment. In particular the WK-D-UL cooling elements can be used with metal ceiling tiles provided by the customer, of all standard designs; they can also be combined with plasterboard ceilings. In the case of a continuous radiant chilled ceiling, approx. 55 % of the internal load is dissipated by radiation and approx. 45 % by convection. The WK-D-UL cooling elements consist of thermal conduction bars into which a pipe meander is pressed in such a way that total contact is ensured; this guarantees optimum thermal conduction. To ensure proper contact with the ceiling tiles, the thermal conduction bars are fitted with a magnetic strip which is inserted in the centre in the case of steel tile ceilings, and with doublesided adhesive tape in the case of aluminium ceiling tiles and plasterboard ceilings.